The above are common problems caused by nutritional deficiencies. These problems are more than rampant. One could say that America (and much of the world) has a nutritional deficiency epidemic. To mitigate this problem, more than 50% of Americans take a multi-vitamin daily. What they don't realize is that most multi-vitamins are a load of synthetic vitamins that are not available for absorption. Do you want a fortress in the north pole? It could be the best fortress in the world, but it's of no use to you. You can't get to it, and even if you could get to it, there would be no shipping to you, no visitors, no employment and you'd likely starve. A fortress in the north pole is no fortress. Supplement technology has improved and it is now possible to buy high quality supplements that really benefit you in remarkable ways. However, this isn't within everyone's budget. It costs a lot more to buy all the vitamins and minerals you need in supplements than it does to buy it in food, and you're going to eat anyway. You might as well eat your nutritional needs, right? One out of three people are affected by vitamin and mineral deficiencies, according to the World Health Organization. I'd say that all people are affected by them, since it hurts us to see our loved ones suffering from constant chronic pain. The good news is that you can eat your way out of pain. And better yet, you can do it without a limiting diet and without expensive trips to a nutritionist, doctor or other specialist. I'll get to that in a minute. Another reason to not rely on supplements (besides budget): There are trace minerals in food that aren't found in supplements. Beyond that, there are compounds unknown to modern science that could have a significant impact on your health. If the compound is not yet identified by humankind then there is no way to put it into a supplement. Eating a variety of foods is important to consume known (and unknown) compounds that impact human health. Over the past year I've compiled a massive amount of nutritional data, comparing foods of like kinds. I've compiled this data into a book that will give you exactly what you need to solve any nutritional deficiency. Better yet, you don't even have to read much of it to get started immediately. The charts speak for themselves. Just seek foods you like in the charts and then look at their nutritional content and see where your needs and your likes intercept. It's that easy! Which roots are highest in iron? What vegetables are highest in protein? For someone dealing with stomach ulcers, which foods are extremely low in both protein and fat? Which foods are low calorie and high in potassium? What fruit has the best omega-3 to omega-6 ratio? What foods are best for getting a lot of calcium without too much phosphorous? Like you, I wanted answers to these questions. I sought such charts on the web, yet failed to find any. Apparently, they have not be made before! To get the answers I had to spend a year compiling the data. "OMG I am positively awed by your book. It's amazing! So packed full of information! It is such a great reference book. This work deserves recognition! It is fabulous on all counts Raederle!" "Why compare foods by calorie?" It is inappropriately to compare foods by volume. There is no sense in comparing a half cup of almonds to a half cup of lettuce. Nuts are dense, hard to digest, subject to mold, high-calorie, slow down detoxification, high in fat, hard to harvest, expensive at the grocery store, rarely genuinely raw, and so forth. Lettuce is a leafy green that is high in water content (not dense), low in fat (easy to digest), always purchased raw, easy to harvest, and suitable to be the bulk of a human's diet. Half a cup of lettuce is only four calories! That's hardly a drop in the bucket. You're going to consume a minimum of 800 calories even on an extremely low-calorie juice fast, and usually we'll consume 1500 to 2500 calories in a day. An athlete will consume 3000 to 10,000 calories in a day. Half a cup of lettuce is nothing when you're talking thousands of calories. Why compare that to a half cup of almonds which is over two-hundred-and-fifty calories? That's a tremendous amount of dense protein and fats to consume in one sitting. That's way more nuts than is appropriate for most people to consume. If we concluded that almonds were superior to lettuce due to a comparison like that, we'd be making a very skewed conclusion. When we compare by volume across different types of foods, we're doing much worse than comparing apples and oranges. In a half cup of lettuce you'll meet about 2% of your nutritional needs for the day. In the half cup of almonds you'll meet about 24% of your nutritional needs for the day – including getting over 500% of the omega 6 needed for a full day. Almonds sound good when I put it that way, but that isn't a fair way to put it. In just thirty-one calories of lettuce you'll meet 12% of your nutritional needs for the day. In thirty-one calories of almonds you'll only meet 4% of your nutritional needs for the day. What a huge difference it makes to compare by calorie instead of volume! Almonds take more than four times as long to digest for only a quarter of the nutrition! Now almonds are looking pretty inferior, aren't they? And I'm just comparing almonds to lettuce; imagine what happens when almonds are up against kale, chard, watercress, dandelions or radishes...! Think about it this way. You're likely only going to eat 1200 to 2500 calories in a day. If you eat 2000 calories worth of nuts, seeds, grains and beans, you absolutely will not get enough beta carotene, vitamin c, vitamin k, calcium and many other important nutrients and antioxidants. This is a fact. I've tried combining quinoa with almonds and walnuts and a Brazil nut for selenium, etc, to come up with some combination where you could meet your nutritional needs with nuts, seeds, grains and legumes, and it isn't possible. The seeds category of foods (which includes legumes, nuts and grains) is great for a few particular things: zinc, selenium and Omega fatty acids. However, you can get those three nutrients and everything else seeds have to offer from vegetables. Seeds are a high-calorie food and that is their main asset. Raw energy in the form of calories. Because vegetables are only deficient in calories. You can meet all of your nutritional needs in only eight hundred calories of vegetables per day. That's it! It takes 3000 calories of fruit to meet all of your nutritional needs in a day. It wouldn't be possible with seeds or animal products whatsoever, with any amount of calories. The charts in this book will help you understand what I'm telling you in much greater depth. We're putting foods on a level playground by comparing like-foods (fruits to fruits and greens to greens) as well as by giving overall comparisons for individual nutrients. After all, almonds and lettuce do not take the place of each other no matter how you slice it. You may choose lettuce or spinach; sunflower seeds or chia seeds; avocados or olives; a zucchini or a cucumber – but you won't say “Do I want to eat walnuts today or kale?” They can not take the place of one another, no matter what volume you eat. Trying to meet all of your energy needs (your calorie needs) with kale is just as crazy as trying to meet you nutritional needs with almonds. Animal products and seeds are in the same category together: calorie sources. That is their main place in history and their main place today. They are preservable calories that can be kept throughout the winter to stave off starvation. Throughout history we have preserved nuts, seeds, grains, legumes, dried meet, and cheese for the purpose of survival through the hard times. If you want an optimal experience of life you'll need the most diverse diet you can attain. There are compounds in foods that are rare. The lycopene found in tomato skin is unusual, the bromelain found in pineapple core is unusual, the papain found in papaya is unusual. You're not likely to get these beneficial compounds if you never eat tomatoes or pineapples or papaya. There are unusual beneficial properties in a tremendous variety of foods. To get these benefits you must eat a tremendous variety of foods. This does not mean you should eat poisons in moderation. It is “all good things in moderation” and poisons are never good. My charts contain foods that are most certainly good, especially if they are fresh and organic or better yet – home grown or wild. Perhaps most importantly, these charts contain foods that are commonly consumed and available at your local produce store. For a total of 140 different whole foods! This is a much greater variety than most people consume in the course of a year. This book will accommodate picky eaters! These foods are analyzed in these 30 areas: calories, fat, protein, water content, starch, B1, B2, B3, B4, B5, B6, B9, A, C, E, K, Calcium, Iron, Magnesium, Manganese, Phosphorus, Potassium, Selenium, Zinc, Protein, Lysine, Omega-3, Omega-6 and in their ratios of Omega 3 to Omega 6 as well as their Calcium to Phospherous ratios. This book will equip you with the precise information you need to solve your individual nutritional needs – without consulting a specialist at the rate of an $arm-and-leg per hour. Thiamine, Niacin, Riboflavin, Pantothenic Acid, Pyridoxine, Beta-Carotene, Vitamin C, Vitamin E, Calcium, Iron, Magnesium, Selenium, Zinc, Protein, Omega 3 to Omega 6 ratio, Calcium to Phosphorus ratio. In some of these charts even more than the original 140 foods are included. There is also a summary of conclusions that can be drawn from the charts included. 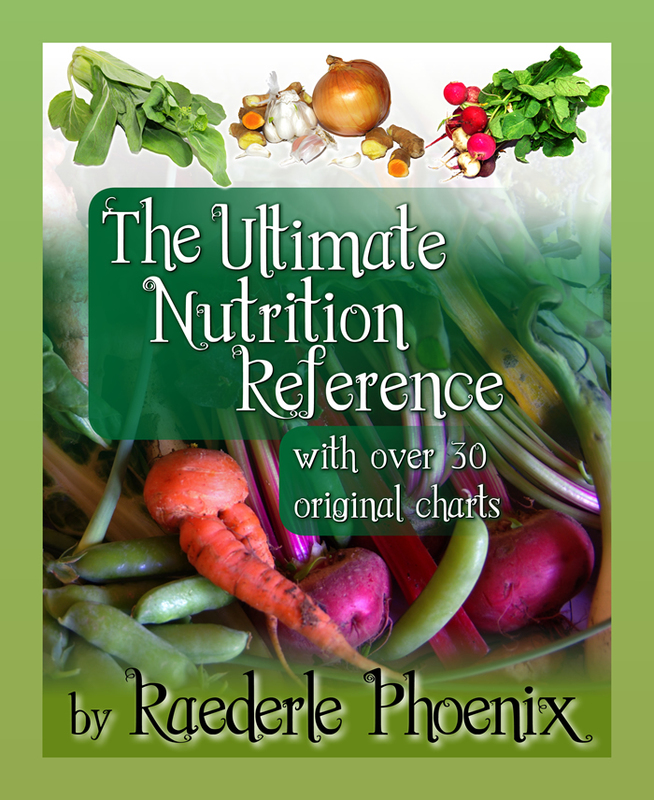 Solving a nutritional deficiency will become straight forward with this book! No more mystery, and no more reading vague articles that claim a certain food is "high" in iron. No more incomplete information floating around in your brain confusing and clouding your decisions. You'll be able to act with certainty. No more hours seeking answers without finding concrete information. These charts are based on the official USDA suggested daily allowances and food data, but compiled as you've never see them before. "How do I know what nutritional deficiency I might have?" Scroll down to learn about analyzing probable deficiencies. Or, if you already know about your deficiencies and are ready to solve them, buy now. 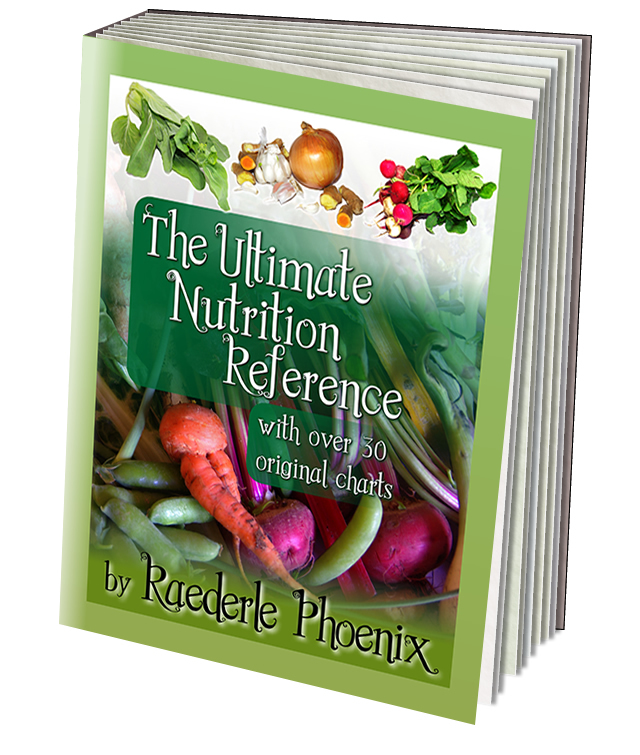 For a limited time, this book can be bought in a collection for a significant discount with my nutritionally complete meal plans and recipe book. Click here to learn more about getting the whole collection or scroll down to get Vitamin Confusion Solution. Well, that's fairly easy. You can get a blood test and have your levels checked which is fairly inexpensive and sometimes even covered by health insurance. Here is an easy way to start: See which cluster(s) of symptoms below sounds like your own symptoms. The World Health Organization estimates 13.8 million children to have some degree of visual loss related to a Vitamin A deficiency. Ready to be rid of these pesky debilitating problems? I wish you a life free from nutritional deficiencies and abundant in vitality!